Important note: The article below applies to the old screensaver version of ScreenSleeves. This has been superseded by a standalone app, but the appearance and the options are pretty much the same as described below. The settings for the new app are found in the app's Preferences. It's a shame that the Lounge screensaver seems to have disappeared. It displays only the currently playing album cover with some details in a very neat, easy-on-the-eye-way (a la Front Row). Being a screensaver it just kicks in if you leave your computer or mouse to your hot corner. So I set about writing a similar app. But with Spotify support too, which I would have liked in Lounge - I use both iTunes and Spotify equally. 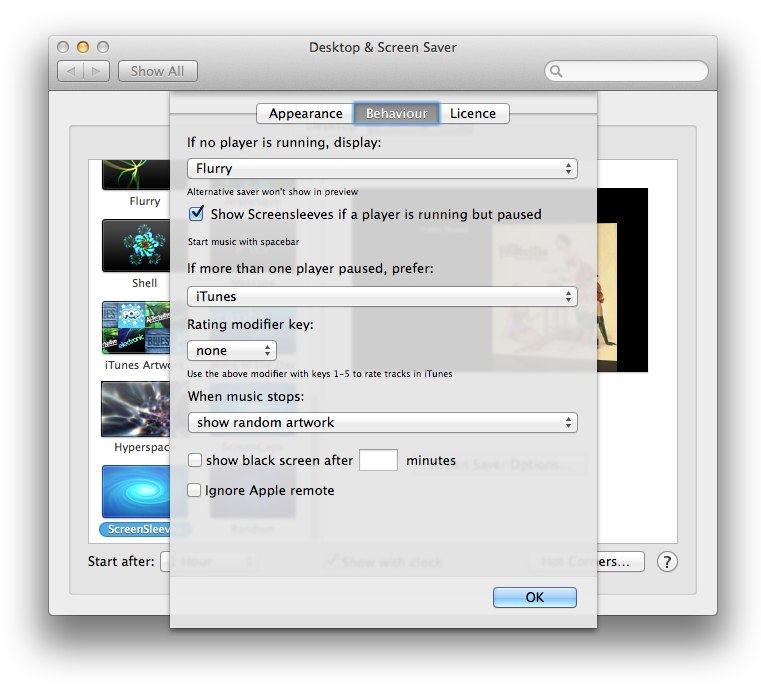 As with most screensavers there are some options, and it's not always obvious how to find these options. So here's a quick tutorial. Simply double-click the package icon from within the downloaded dmg. System Preferences will open and confirm that you'd like to install the saver. It'll do so and show you a preview. Note that with earlier systems you may need to click the saver's name in the left-hand list if you want to switch to it. 1. Theme: Choose from Classic, Text, Mosaic, Full-Screen or Random. Random chooses one of the graphic themes (not Text) each time the screensaver kicks in. Preview window in System Prefs will not be the same theme as the one chosen when the saver kicks in for real. 2. Artwork size: The artwork and text size will adjust itself to be suitable for your screen size, but you can make the default size larger or smaller. 4. Font size: Adjusts the size of the text. With some themes the font size may also be sized relative to the artwork size. 5. Rating / Popularity: If iTunes is playing, your star rating will be displayed and you can press keys 0-5 to change the rating. If Spotify is playing, the Spotify popularity will be shown. You are unable to change this except by playing the tune which is a vote for it. 6. A Progress bar can be displayed showing the position within the current track. 7. Show Total track time / Time remaining: If progress bar is showing it can display a counter showing either of these things. 8. Keep centred and static: If you are sure your screen isn't burnable, you can fix the position of the artwork and text. It will only fade when the track changes. 9. If no artwork available: These buttons choose what Screensleeves does. It can display a default image, or no image. 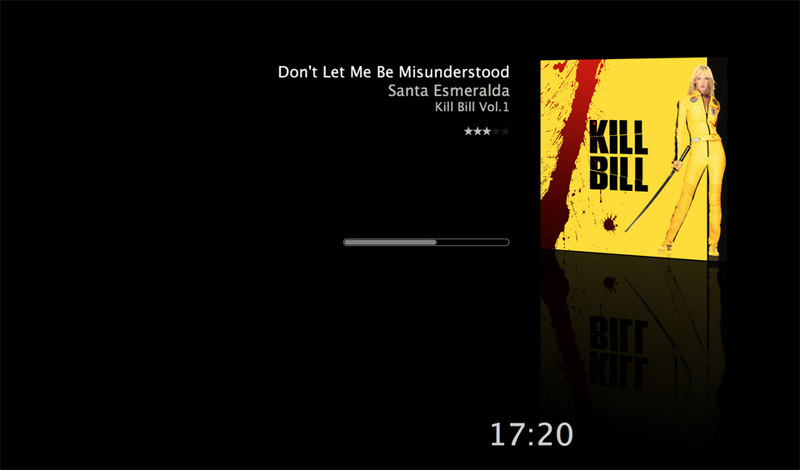 Since v3.4.3 it's been able to very sucessfully fetch album art from the web. The last box about Snowtape is there because Snowtape currently provides artwork which is low-quality and often not the correct cover. With the box checked, SS will try to override the artwork Snowtape provides with a cover fetched from the web. 10. Always find from the web with Snowtape / Rdio: Depending on the type of music you're listening to, Snowtape may not provide the best album cover for the track playing. In both cases, these players provide lower-res images than is desirable when Screensleeves is displaying larger artwork sizes. This option forces Screensleeves to source a better quality and perhaps more appropriate image from the web. 12. This box allows you to choose whether the alternative saver cuts in if there's no music playing, or if no music player is running. Checking this box means that if there's a player available, but paused, ScreenSleeves will display a 'Paused' message and allow you to start the player using the spacebar. 13. If both players are running but paused, these buttons allow you to choose which one starts playing when you press the spacebar. 14. Setting a modifier helps to prevent the rating of a track being changed accidentally. 'none' means that you can just press keys 0-5 to set the rating. 'control', 'alt', or 'cmd' mean that you have to press that key along with 0-5 to change the rating. 15. If you're going to sleep to music, or for some other reason want the screen to black out when the music stops or after a delay, here are the options. As per any screensaver, it'll kick in after a preset time, or you can trigger it manually by setting up a Hot Corner. While your System Preferences window is showing, you can use the 'Test' or 'Preview' button for a full-screen preview. I'm sorry that this is necessary. The screensaver has taken many many working days (and I will spend more improving it). You can get your ScreenSleeves key here. Enter it in the 'Key' box below 'Licence' and the 'Please Support' message will be removed. Guys, I need some help here. I just paid for a license key to screensleeves, but the "LICENSE" option in my system prefs is not there, only appearance and behaviour. Please advise. Hi Scott, you'll need to download the Pro version from Scrensleeves' home page - you'll see both versions for download there. The reason for two versions is a long story and a bit of a nuisance, only the pro version has the box for the licence key and all the pro options. Ideally you want to delete the free version from your screensavers before installing the Pro version. Let me know if you still have trouble after that. Would be nice if artwork was displayed even while paused. 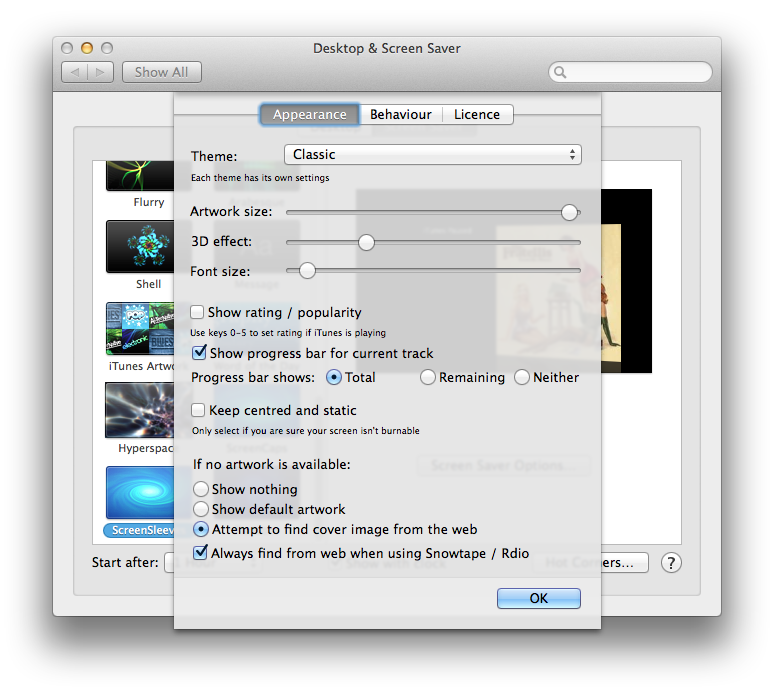 Under 'behaviour' in the settings, there is an option for "When music stops: show random artwork", but this does pull random artwork from your iTunes collection, and so relies on you having some music in there, which not everyone does.